The company was started in India, with its main headquarters in New Dehli. Vestige Marketing opened up shop in 2004, so they’ve been around for over a decade now. Vestige Marketing was started by three successful Indian entrepreneurs – Gautam Bali, Deepak Sood, and Kanwar Bir Singh. Singh, Vestige’s IT Director, has years of experience heading software development teams at multi-national direct selling companies. Sood, the company’s Director of Operations, is an operations expert with years of experience in everything from logistics to warehousing to networking. Over a million distributors. Insane! This company is huge. On top of that, they’ve also got over 1,000 full-time employees, 1,100 service centers, and 24 branch offices. Vestige carries more products than your local drugstore. They’ve even made it a goal to introduce 15 new products every year. Manufacturing standards were recently updated with an ISO 9001-2015 certification, which they don’t appear to have, but it is fairly new and a lot of companies are still adjusting. Vestige Marketing calls the distributor discount of 10%-20% a “Savings on Consumption.” Of course, this is also your commission on personal sales, should you make any. Clearly, the focus when it comes to income is placed on recruiting. While 20% is on the lower end of the standard range for commission, earning less than that is a pretty poor commission rate. To make up for their poor commission on personal sales, Vestige does offer one of the better performance bonuses in the industry. #4. Travel fund? House fund? What?! Car bonuses are a dime a dozen in MLM (hint: Mary Kay and Kyani). But you tell me someone’s gonna bankroll my trips to Greece and buy me that dream house in Malibu? Silver Directors and above are allocated 3% of the company’s monthly BV which is translated into a point value. These points can then be used for company travel trips. 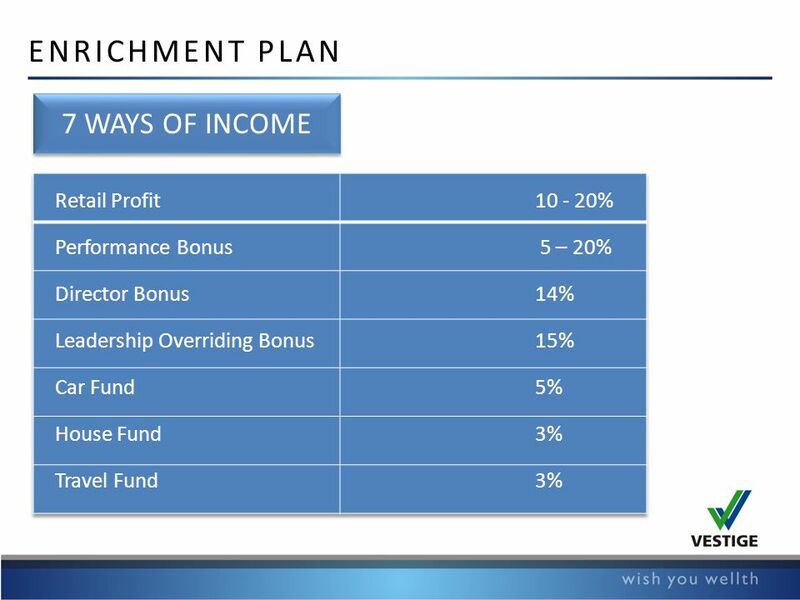 Alright, so not that different from the trip bonuses offered by other MLMs. Crown Directors and above are allocated 3% of the company’s monthly BV which is translated into a point value. These points can be used toward mortgage payments. This bonus is pretty unique. The direct selling industry may see some rough patches in the states, but it is smooth sailing in India. According to a recent report ‘Direct Selling: Dehli – A Global Industry, Empowering Millions’, direct selling is predicted to become a top industry by 2025. The health and wellness, cosmetics, and household goods industries (of which Vestige Marketing is a part) are also expected to grow at 10-16%. Because direct selling, which is newer and less established in India, has been growing so quickly, it’s also gaining more attention from the government. The report also implies that a slew of reforms will likely take place over the next decade as the government tries to ensure that companies are operating ethically and sustainable. We’ve seen MLMs get shut down time and time again in the U.S., so it wouldn’t be a surprise if this eventually started happening in India. The question, then, is whether or not Vestige Market will be able to adapt and continue to grow amidst changing laws and regulations. However, the products were never withdrawn, and the FSSAI and the FDA have yet to find the power to enforce their directives. While Vestige Marketing community has a lot of good things going for them, I wouldn’t necessarily recommend them for a money-making opportunity. Not a Vestige hater, I just think you could get more reward for your efforts elsewhere.